In 2008 after the MPT portfolios that I was teaching NAOI students to create crashed along with the market, I stopped all NAOI investor education activities. 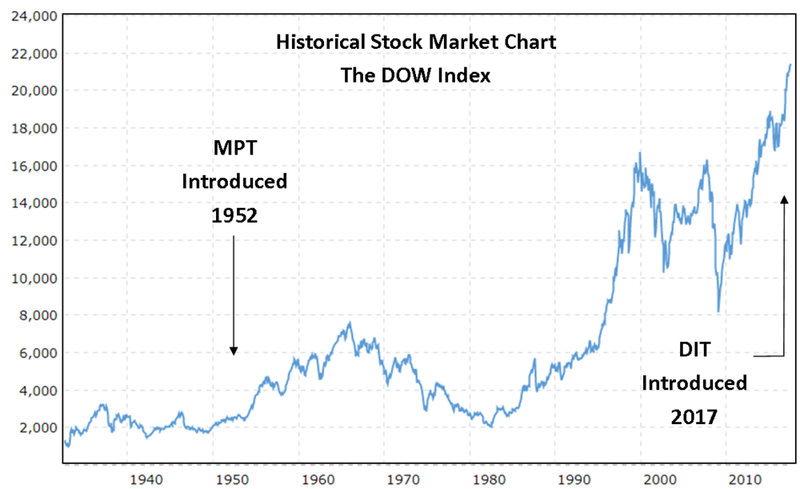 I saw that Modern Portfolio Theory (MPT), the standard approach to portfolio design for over six decades, simply could not cope with modern markets. This needed to change, And since my search of investing developments currently in progress revealed that none, outside of hedge funds, involved challenging MPT, I concluded that I would have to do it on my own using NAOI resources. As I started the research effort I was adamant that any new approach to investing would be designed to meet the goals of the investing public. So our first task was to interview average people with money to invest. Fortunately the NAOI has access to hundreds of individual investors who are either NAOI students or NAOI members. And they represent an excellent cross-section of the investing public. We asked them what they wanted and needed to become confident investors and willing to enter the equity markets without fear. In summary, here is what they wanted. We immediately saw that MPT met none of these goals. So we started with a blank slate; as if MPT had never existed. From the start, it was obvious to us that the only way to meet the goals set for us by the public was to develop an approach in which trade decisions are made based on observations of historical equity market data instead of on subjective human judgments as they are today. We would NOT create an approach in which the competency / honesty of an advisor was a variable in how well a portfolio performs. For our goals to be met, we needed to find patterns in historical data that had proven predictive value for future equity price movements. Based on significant time and effort devoted to studying years of of equity pricing data, we found what we were looking for in equity price trends. We saw that the prices of asset classes and markets are cyclical and that different asset types and different market segments move up and down at different times as illustrated below. This observation led us to the premise that at all times and in all economic conditions, there exists somewhere in the market uptrending prices and thus positive returns potential. Our task then became to design and build an investment type that could detect these areas and capture their positive returns potential while avoiding areas of the market that were trending down in price. Following a multi-year research effort, we fulfilled this task with the creation of NAOI Dynamic Investments (DIs). After significant testing of DIs showed to us that our premise was true with a high degree of confidence, we transformed it into a theory that we called Dynamic Investment Theory (DIT). NAOI Dynamic Investments met all of the goals set for us by the investing public at the start of our research effort. You will learn how on the next page of this presentation found here. DIT evolves the world of investing from the 1950’s to the 21st Century as illustrated below. A word of caution is appropriate here. It would be a mistake to pigeon-hole the approach you are learning about on this page as “momentum investing” - an approach that has been used many times in the past in multiple forms and with varying degrees of success.